This sure won't make the "Good News" thread & with some of these cartels gaining ground in America using the Hispanic/Mexican gangs. P.S. I do hope that follow the guns a**hole foolish idea has died. America needs to play catch up with these guys. And the sooner they start the best for all period, or the likes of what they have done on their side of the boarder might soon come to America in ways we have yet to see. P.S. some of the things they have done in Mexico they have done in America: Just do searches in locals like LA, AZ., TX., and other boarder states. Then check out DC, or about any other state were these International Gangs operate. MEXICO CITY (AP) — Two government helicopter gunships opened fire on 10 vehicles fleeing a luxury beach condo complex during this week's gun battle at the Gulf of California resort of Puerto Penasco, Mexican authorities said. New details emerged about the raging gun battle that ensued after federal forces tried to capture a reputed top lieutenant of the Sinaloa drug cartel who was staying at a beachfront villa. Mexico's federal police said late Thursday that two government Blackhawk helicopters fired on at least 10 vehicles as they tried to flee the complex with drug cartel operator Gonzalo Inzunza. The vehicles were hit by gunfire in the Wednesday battle and were "left useless, causing the assailants to disperse." Five presumed cartel gunmen were killed in the battle. Police found 14 sniper or assault rifles at the scene, which one federal official confirmed were of heavy caliber. Two federal officers were wounded in the gunfight. The bullet-ridden, burned-out vehicles were left just outside the complex, which federal police did not identify. But Puerto Penasco city spokesman Cristobal Garcia confirmed Friday that the shootout actually began inside the Bella Sirena complex, where Inzunza was staying at a beachfront villa. The resort has units for both sale and rent, but it was unclear if the reputed capo owned or was renting the unit in which he was staying. Garcia insisted that "these are not people who live in Puerto Penasco ... perhaps they were here on a holiday." But federal police said Inzunza, 42, "has set up his center of operations in Puerto Penasco," to run drug-trafficking networks that stretched through at least seven other states, from the Caribbean coast state of Quintana Roo in Mexico's southeast to Baja California in the country's northwest. They said Inzunza "had a personal relationship with Ismael ("El Mayo") Zambada," long viewed as the No. 2 leader of the Sinaloa cartel, after Joaquin "El Chapo" Guzman. Inzunza's body was not found at the scene, and federal officials said they believed the fleeing gunmen took his dead or wounded body with them, as cartel gunmen sometimes do with fallen gang members or leaders. Federal police said late Thursday that an analysis of blood stains found in the vehicles show that Inzunza was among those killed or wounded. Drug cartel shootouts at Mexico's beach resorts generally have been rare, though some have been reported in the past in the Pacific coast resort of Acapulco. Prosecutors in the Gulf coast state of Veracruz said Friday they had found seven bodies dumped on a beach just south of the seaside city of Veracruz. They did not provide identities or a cause of death. Mon Mar 20, 2017 | Investigators unearthed the skulls of 47 more suspected victims of Mexico's drug war in Veracruz state, just days after uncovering 250 skulls at a separate mass grave used by drug cartels, the state's attorney general said on Sunday. Veracruz, on Mexico's Gulf coast, has long been a stomping ground for criminal gangs, who fight over lucrative drug and migrant smuggling routes. Giving details on the latest grisly find, Jorge Winckler said the skulls and remains of multiple body parts were unearthed from eight unmarked graves, clustered in a 120 sq meter area, about 10 kilometers (6 miles) from the town of Alvarado. So far, Winckler said, investigators had positively identified one three-person family, missing since September 2016, and the remains of two other men. "The work continues," Winckler told a news conference, vowing to track down the perpetrators. Just days earlier, investigators recovered more than 250 skulls from another unmarked grave 60 kilometers (37 miles)further north in the Gulf state of Veracruz. That burial site was uncovered by relatives of missing family members, impatient with officials' apathetic response, who launched their own search for missing family members. The relatives' groups have exposed the government's slow progress in attending to rights abuses and victims. The former governor of Veracruz, Javier Duarte, who belonged to the country's ruling party, is a fugitive, fleeing organized crime charges. 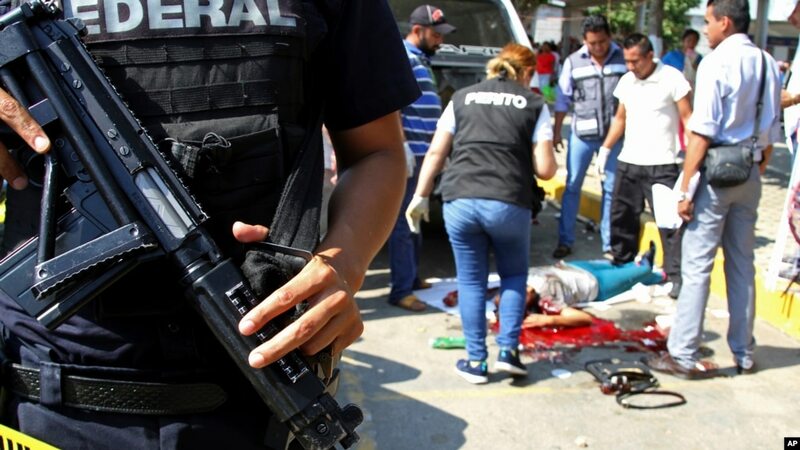 Separately, on Sunday the Veracruz attorney general's office said it was investigating the murder of a journalist, Ricardo Monlui, who was shot dead in the town of Yanga. Veracruz is the most dangerous state in Mexico for journalists. The Committee to Protect Journalists said in 2016 that at least six reporters had been killed for their work since 2010, when Duarte took office, adding it was investigating nine other cases. November 21, 2017 — There were more killings in October in Mexico than in any other month in at least 20 years, according to official data. It's the latest grim milestone in 2017, a year on course to register the highest homicide tally since modern records began. Mexican President Enrique Pena Nieto's failure to tackle growing drug violence is seen as a major weakness ahead of next July's presidential election, where he faces an uphill battle to keep his centrist Institutional Revolutionary Party (PRI) in power. The data, published by Mexico's Interior Ministry on Monday, showed there were 2,371 homicide investigations opened in October. With 20,878 slayings nationwide in the first 10 months of 2017, this year is on track to overtake 2011 as the most violent since the government began publishing such data in 1997. There were an average of 69 killings a day so far this year, putting Mexico on track to overtake the 2011 homicide tally before the end of November. In 2011, there were an average of 63 slayings per day, according to Reuters' calculations. In a speech this month, Pena Nieto acknowledged that crime and violence had been rising. "It has to be said, we're still not satisfied, and we still have lots more to achieve," he said. "Security needs to remain an utmost priority for the government." In further bad news for Pena Nieto's unpopular government, Silvestre de la Toba, the head of the Baja California Sur state human rights commission, was shot dead on Monday. His killing drew criticism from U.S. Ambassador to Mexico Roberta Jacobson, who tweeted that his death should be fully investigated. Baja California Sur, which includes the popular resort of Los Cabos, is one of the states that have seen the sharpest rise in killings. There were 409 in the first 10 months of 2017, up 178 percent from the same period last year. waltky, what you pasted is current news, so why add it to an old thread? Why not start a new one? Inquiring minds want to know. Pappy sez: This crap is nothing more than in your face I can get by with this and so I will. A suggestion for the mods. Why not post along with the thread title the date of the OP? As it is here is no way to know if you are responding to a years old thread or current news.